You guys. You guys are the best! Baking MADE friends last night! 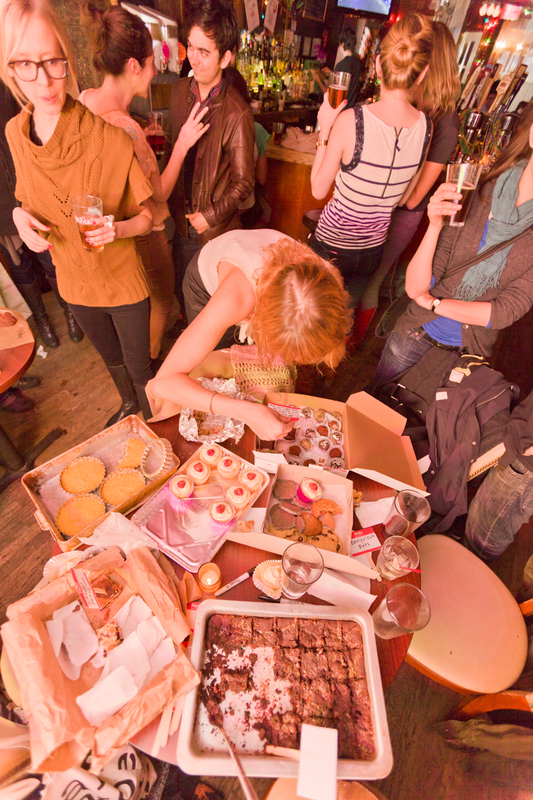 Thank you to everyone who baked delicious treats! Thank you to everyone who came and enjoyed the massive selection of baked goods! Thank you for letting me pimp out my tote bags to y’all! Laura made whiskey chocolate balls. Erin brought a selection of Ovenly goodies. There were cardamon baklava! Poppy seed buckwheat cookies! Rosewater cupcakes! Chocolate ginger cookies! Brownies! Blueberry bars! Lemon tarts brought by bicycle! Kale chips! I could go on and on – there were treats for dayz, my friends. 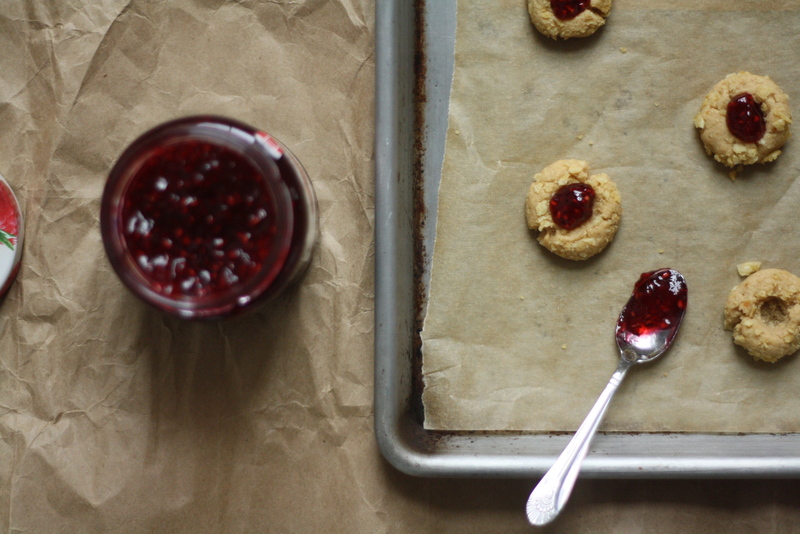 Josie brought these crushed potato chip pb+j thumbprint cookies. I need to share them with you. I am still coming down from my sugar high last night so I went the route of the teeny tiny one-bite cookie. Also, because mini things are cute. A welcome side-effect of these cookies is that for lunch I had a peanut butter and jelly sandwich with potato chips in the middle. Then for nostaligia’s sake I had carrot sticks and milk. Then I did my homework (which has just evolved into a little thing called email) and took a nap. Preheat the oven to 350. Line a baking sheet with parchment. In a medium bowl, cream together the butter, sugars, and peanut butter until light and fluffy, about 2 minutes. Add the egg and vanilla and mix until combined. In a small bowl whisk together the flour, baking soda and salt. Add the flour to the peanut butter mixture and stir until fully incorporated. 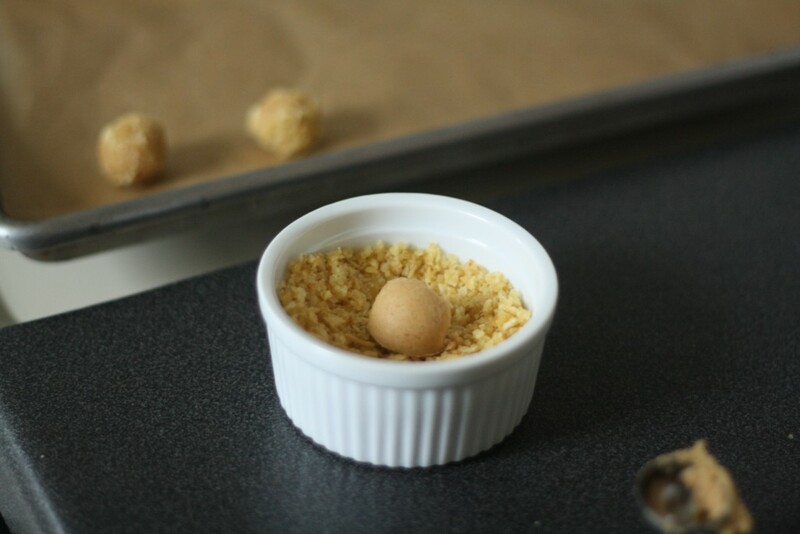 Using a (mini) cookie scoop portion out balls of dough, rolling each in the crushed potato chips and then lightly making an indent with your pinkie finger. 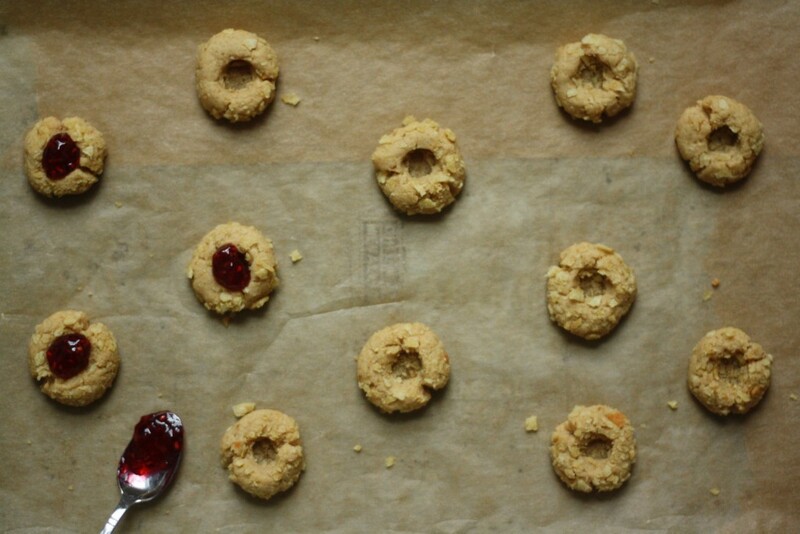 Place the cookie on the prepared sheet and repeat until all your cookies are rolled, shaped, and indented. Bake for about 7 minutes, or until the cookies are slightly puffed and lightly browned. If some of the middles have filled in during baking just use the end of a spoon to lightly re-create the hole. 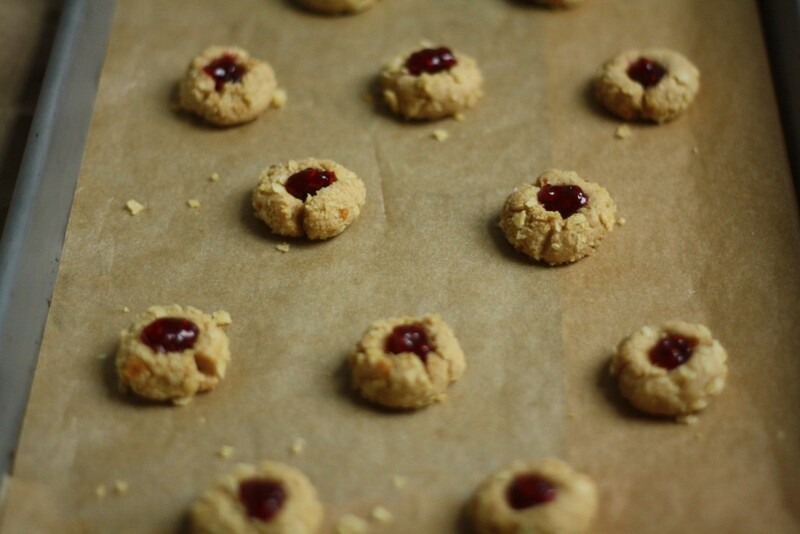 Let the cookies cool and fill each center with a little spoonful of jam. P.S. Thank you Thomas for the photos! 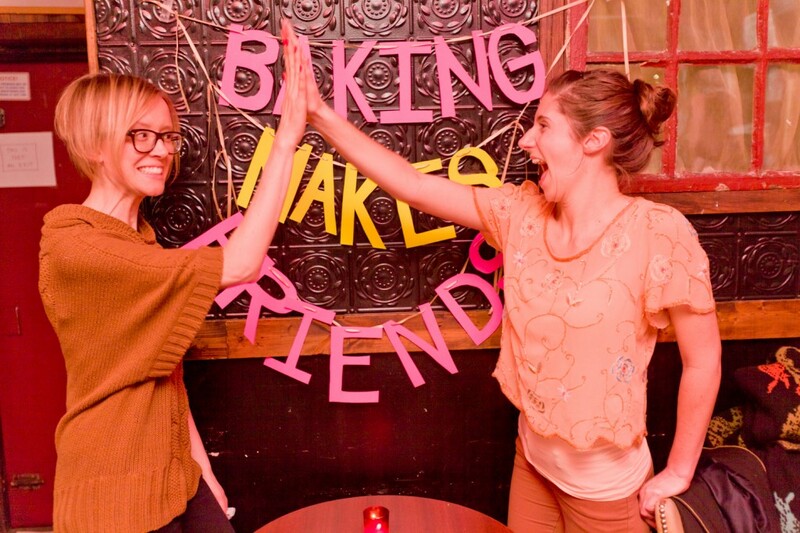 See y’all at the next BAKINGMAKESFRIENDS! Yay! They are sure winners! 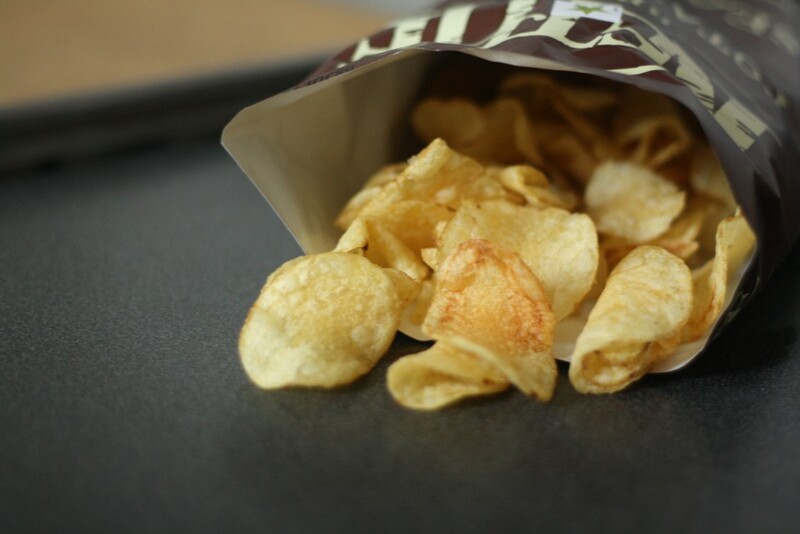 These look positively delicious, and I’m always looking for a way to use potato chips. They are so yummy, but I’ve never really thought of baking with them. Congratulations on the Saveur nomination; that’s actually how I found your blog! Thank you Laura! These cookies are one of my favorite ways to use up chips! Just a quick question. I’m thinking about making these cookies for Christmas but am concerned how long they will keep since they have potato chips on the outside. I was either going to bake them this weekend (12/14) and freeze them until Christmas Eve, or I can bake them next weekend (12/21), but they’d still have to last several days. Do you know if these cookies freeze well, or are they better off stored in an airtight container at room temperature for a few days. Or are these cookies that are best served the same day? I just worry about the potato chips getting soggy or stale.